According to a letter I received from the band secretary, a flag was designed in school by the late Steven Mameanskum. It attempted to provide the Naskapi Band with a unique flag that identified it as the last of the nomadic Indian groups in the Québec-Labrador peninsula. The flag per se has not been adopted officially as the Naskapi Band flag. This flag is used only inside the Naskapi community, although some have been given to Canadian and Québec government representatives and other interest groups. The first image I have seen of the flag dates from the 1990s. The crosses in each corner represent the religious aspect of the Naskapis. The black outline frame isolates the close-knit Naskapis from the outside world. The different colors represent the Naskapi taste in pattern design. The Cree syllabary is used to spell out "The Naskapis" (ᓇᔅᑲᐱ). The green boundary is the sign of earth life, indicating that the Naskapis live with nature. The red boundary indicates that the Naskapis are relatives, thus red blood. The circles represent the suns and the moons of each season. The spear located in the North represents the fact that the Naskapis lived with the spear-throwing Inuit before they moved to Schefferville. The fish are located in the South, where the Naskapis import, through other tribes, special fish from the North Shore. The wigwam is located in the East, where the Naskapis originally came from. The caribou located in the West, where they migrate to way fall, a time of celebration for the Naskapis. The caribou tracks move from East to West in a continuous cycle, being an important aspect of the Naskapis. The geese fly North to South, a time of celebration for the Naskapis. 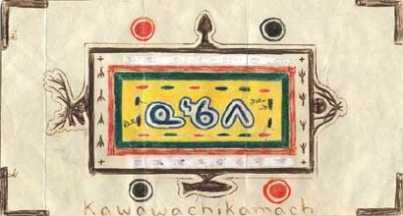 Kawawachikamach may be written at the top or bottom, at right or left.